Universal Human Nation: President Obama was elected on a mandate for HOPE. President Obama was elected on a mandate for HOPE. He, quite rightly, held BP accountable for the recent oil spill disaster in the Gulf of Mexico and their liability is already estimated at $40billion. 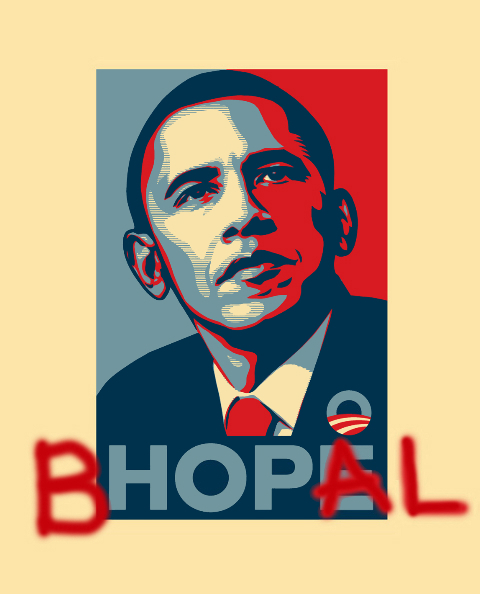 The 1984 Bhopal disaster has NEVER been cleaned up. Toxic waste, from the factory that caused the disaster, has contaminated the drinking water of many tens of thousands of people. They are being poisoned TODAY. An American company, Dow Chemical, are legally responsible for this contamination. President Obama has elected the CEO of Dow Chemical, Mr.Andrew Liveris, to his 'India-US CEO forum'. Will be go beyond empty words and slogans and do something that is logical, that is good for the world ? The time will show the truth. The only problem is the huge cost that the world continues to pay for the inability of the so-called-leaders.